Harvey may seem like a whimsical choice for a Best Movies list. It's odd, and no earth-shattering issues seem to be addressed in the story. But there's more to Harvey than meets the eye – and I'm not just talking about the giant, invisible rabbit. The first time I saw Harvey, I enjoyed it very much as a charming comedy with a touch of fantasy. 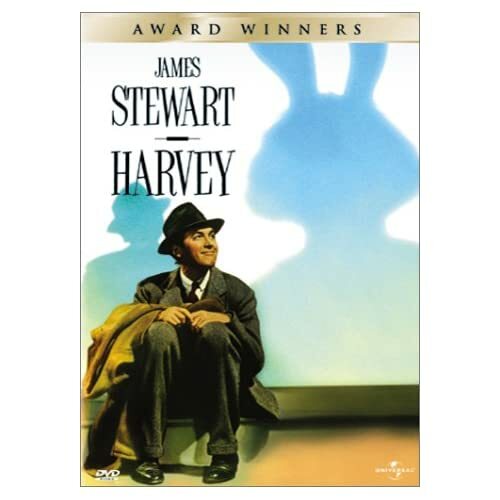 In a nutshell, it's about a guy named Elwood P. Dowd who keeps company with a giant, invisible rabbit named Harvey. His sister (played by wonderful Josephine Hull) and her daughter think he's nuts, and his behavior is seriously cramping their style with the society folk in town. His sister decides he should be committed to the local sanitarium so she and her daughter can get on with their lives. But her attempts to put him away have unexpected results. I like this movie so much, I've seen it at least a dozen times over the past decade. As I got older, I began to realize that the movie struck me a little differently every time I saw it. New layers are exposed with each viewing – and finally I understood that under all that light-hearted whimsy, Harvey is the story of a shattered man. 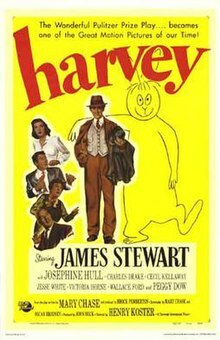 Jimmy Stewart played Elwood P. Dowd, Harvey's best buddy, in both the movie and the stage version. I doubt anyone else could have nailed the role, though Jim Parsons (Sheldon from The Big Bang Theory) seems like a good choice for the new stage version. Stewart is an essential American character, very much a product of his place and time. He raises his voice when he's irritated or excited, but when he's truly angered or troubled, his voice becomes quieter. As Elwood, he's unfailingly kind and courteous, so people respond to him warmly. Elwood is so likeable, some people even continue to like him after he introduces them to the invisible rabbit. Elwood is younger than his sister, and their elderly mother doted on him. She left the entire estate to him when she passed away, which is another reason his sister feels she has to wrest Power of Attorney from him. He likes to invite people to supper at the home he shares with his sister and niece, regardless of who the people are or how long he's known them (usually just a few minutes). He is oblivious to class, race, religion, or any other social distinction, and in that time and place that's just plain awkward. Elwood seems innocent, perhaps a bit simple, and childlike in his reaction to people. But if you really listen to him, you realize this is far from the case. Before his mother died, Elwood used to be a different man. As a member of the upper class, he was among movers and shakers. But something seems to have snapped in him. He quotes his mother a lot, and one wonders if her death was a blow from which he couldn't completely recover. His remarks also indicate a sense of futility in the pursuit of money, status, and power. After all, what good is any of that when the person you loved most in the world is gone? His recovery from this loss is fragile, but something unexpected has come along to help him hold it together: Harvey the pookah becomes his friend, confidant, and drinking buddy. As the story begins to unfold, we find out that pookahs aren't just fun-loving, they have interesting powers, too. For instance, they can stop time. If they really like someone, they have a protective streak, too. Elwood needs that protection, because the misguided doctor in the movie believes the only way to shock Elwood back into a normal life is to give him a chemical lobotomy in the form of a drug called Formula 977. If Harvey were just about this dreadful injection, it would be a horror movie. Before the whole thing is over, you wonder if sweet, kind-hearted Elwood won't be shattered for good. The story in Harvey works on multiple levels, and that alone would make it a good movie. But it also has a marvelous cast, and their deft performances are unforgettable. A less skilled actor than Stewart might have overplayed Elwood's simplicity, or camped up the whole invisible rabbit thing. Instead, Stewart plays the part not only with perfect comic timing, but also with a subtlety that allows you to understand Elwood's character once you really start to listen. The dark undercurrent in Elwood's life actually reminds me of a heart-breaking scene in the movie It's A Wonderful Life, another story that's often described as too sugary and feel-good. Anyone who describes it that way must not have seen the scene in which Stewart's character George Bailey, at the end of his rope after a large sum of money has disappeared, prays desperately to God for help. When God answers the prayer, it's not with an instant fix (Here's the money, pal – good luck!). Instead, he finds a way to let George know his life matters to people, that he's not alone. Harvey finds a way to do that for Elwood, too. By the end of the movie, you realize that Elwood and Harvey probably have the best approach to life after all. And that's why Harvey is another permanent resident of my Best Movies list. But -- Which Thief Of Bagdad?